The new SolSmart designation program, from the ICMA and The Solar Foundation, will recognize leading solar cities and local governments that “cut the red tape,” taking action to foster solar market growth. Over the three-year, federally-funded portion of the program, SolSmart will recognize more than 300 communities. 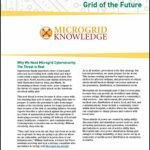 Learn ways cities pay for microgrids at the Microgrid Knowledge conference May 19. SolSmart also seeks to address soft costs of going solar: business processes or administrative costs that can increase the time and money it takes for a new community to install a solar energy system. Cities can apply to host a SolSmart Advisor, a fully-funded temporary staff member providing no-cost technical assistance to help achieve SolSmart designation. He added that the solar panels installed on the city’s water treatment plant have partially offset its annual utility costs. “Solar gives us another tool to help manage operational costs. SolSmart presents cities and counties nationwide with an opportunity to realize similar benefits, and I encourage every community to join Gladstone and get involved,” he said. SolSmart is funded by the U.S Department of Energy SunShot Initiative through the Solar Powering America by Recognizing Communities (SPARC) funding opportunity. Algonquin College unveiled a high-efficiency, natural gas cogeneration power plant at its Ottowa campus. The plant will generate 2 MW of power – enough to cover the baseline power needs of the Ottawa campus. The heat generated by the plant will be retained by the system and used to heat and cool the college, further reducing Algonquin’s energy expenses. In the case of an electricity outage, the college will be able to continue operations. The cogeneration plant is part of Algonquin College’s Guaranteed Energy Savings Contract (ESCO) with Siemens, a 20-year, multi-million collaboration that has resulted in numerous efficiency and sustainability retrofits to the Ottawa campus. “This project is a game-changer in our efforts to maintain our facilities, control our costs, and expand the learning opportunities for our students,” said Cheryl Jensen, President, Algonquin College. Siemens Canada and Algonquin are collaborating on academic programming to maximize experiential learning opportunities for students and lead to new applied research opportunities. Beginning Fall 2017, the college will also offer a graduate certificate program in energy management aimed at students with existing credentials who are looking to further their careers in the energy sector. Black & Veatch’s microgrid has been selected for a prestigious Gold Edison Award. Its microgrid system at the company’s World Headquarters — the largest office building in Kansas — provides enough clean energy to run its 12,000 square-foot Rodman Innovation Pavilion. Adding resilience while lowering energy costs, the microgrid can operate as an independent power source or in support of the traditional electric grid. The microgrid generates electricity through a combination of natural gas, solar energy, geothermal and battery storage. The system also includes two natural gas-fired microturbines that deliver onsite electrical power generation. During winter months, heat is recovered from the microturbines to support climate control. A geothermal heat pump system with 15 wells each drilled 500 feet deep also helps heat and cool the Pavilion. The microgrid system also uses battery technology to capture and store energy from generation resources and deliver electricity to the headquarters during times of high electric demand. Visitors to the headquarters can view the microgrid’s output in real time on a large-screen monitor that graphically displays how each part of the microgrid is performing. Primus Power and Eaton announced a strategic collaboration to deliver low-cost, long-duration flow battery energy storage solutions for utility, commercial and industrial customers. 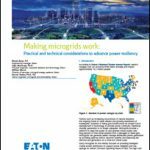 The joint solution can be used as a stand-alone system or integrated into Eaton’s microgrid energy system, which is designed to help simplify and expedite the deployment of complex microgrid and energy storage systems. Eaton’s microgrid system incorporates its Power Xpert Energy Optimizer controller and provides a modular, scalable approach to microgrid control in military, campus, utility, healthcare, commercial, community, and other applications. The microgrid energy system and controller are configurable for specific requirements and designed to seamlessly integrate with a wide range of energy storage configurations and solutions from various battery manufacturers. Primus brings its EnergyPod flow battery systems to the collaboration. A demonstration of the new flow battery system will be installed at Eaton’s facility in Hayward, California, in close proximity to Primus’ global headquarters. The Halfmoon Community Solar Project in New York state will allow more than 100 residential customers, including low-income residents, to participate in local clean power generation — and save money on their electricity bills. The project will also feed solar energy to the grid operated by New York State Electric & Gas (NYSEG). Under the state’s Shared Renewables Program, residents can purchase individual solar panels in the Halfmoon array and receive credit for the power production directly on their monthly electric bills, as if the panels were located on their own roof. 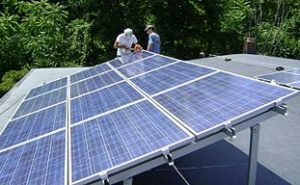 The Shared Renewables Program provides opportunities for renters, homeowners, low-income residents, schools and businesses to join together to set up shared renewable energy projects resulting in healthier and stronger communities. The Halfmoon project is specifically for renters, homeowners and low-income residents. Follow us on Twitter @MicrogridNews. Is the Low-Carbon Microgrid Next? Why this website do not have different languages support? There are so many ways to save on power and to keep it running without electricity. I’ve been wanting learn more about these processes and how one can become apart of it. It’s cool that they are making more of a push to make this solar energy a big part of communities to help save on energy.